First things first: What is a content plan? 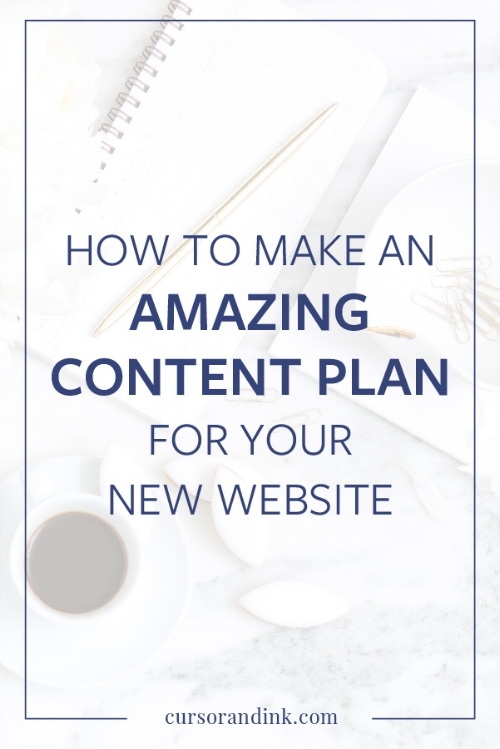 Your content plan is a package of information that identifies all of the content that you’ll need to have on your new website and shows how all of that content is connected and works together. This begs the question, When should I create this plan? The answer is, start early in the process, and plan to update it as you go. My recommendation is to put together a draft after you’ve done the brand discovery work, but before the designer actually starts work on developing the website. That way the designer can use your plan to inform their web design, but you can also update it along the way as you move through the project. Key Objectives: This will identify what you want visitors to do when they come to your site. Is your goal to encourage email signups? To get them to visit your shop? To go read your blog? Knowing what your priorities are will help you to build content and a visual design that supports those objectives. Site map: This is a visual representation of how all of the pages on your site will actually be organized. It will identify menu items, sub menus (if you’re using them), footer items, and pages that won’t be included in any menu at all but will be linked to from other content. Content maps / outlines for each page: In this section, you’ll actually go through each page that needs to be created and make notes about everything that will need to be included for that page. You’re not actually writing the content yet; instead you’re making a checklist of all of the things that need to be on that page – links to other pages, contact forms, signup forms, visuals / images, and perhaps an outline of the actual content itself – so that both you and your designer know exactly what needs to be created for every page, and how each page connects with the rest of the website. If your list includes three or more things, take the time to prioritize which of those objectives is the most important. This is important because it will help to give direction and focus for your website so that you can implement clear calls to action (CTAs) that will encourage your visitor to take the action that you want them to take. Once you have your list, look at some of the more in-depth sections that will require more than one page (e.g. blog, shop, product/service packages) and identify how the pages will interact. How does the blog landing page look? What key functionality is required? How does each individual blog post look? What key functionality is required? What about side bar content, comments policy, related post listings, etc.? Using this information, put together a draft site map that actually shows the relationship between different pages. Start with the menu items that you’ll want at the top of the page, and organize the sub menu items beneath them. Make sure to also identify additional pages that will not be linked from the menu. As you can see from the diagram, this does not need to be fancy or design-y. You can draw this on a piece of paper and take a picture of it, or create a copy in Apple Pages, Powerpoint, Canva, or any other basic office tool that lets you draw text boxes and lines. Important Note #1: This is only a draft site map for now. Your designer will likely have feedback and ideas about how to structure the website in a way that complements the design they create for you, so be prepared to adjust this as part of the design process. Your goal at this point is not to have a final site map – it’s just to get a sense for both you and the designer of all of the different components of the website and how you are expecting them to work together. Take the time to make notes about what each page needs to include. Try to visualize what you expect the page will look like, and make notes about anything that will need to be created (either written content, visuals, or other elements) to make sure they are included. If you have existing content that you’re migrating over from a previous site, make notes about what you’ll keep, what will be edited / revised, and what will need to be drafted from scratch. To help you with this, I’ve created a printable that you can use to map out the key parts of each page and get a clear picture of what kind of content you’ll need to create. Important Note #2: It’s okay if this is only in draft form, or if you don’t have all of the information just yet. One of the important parts of going through this process is that it helps you to identify the areas where you already know what you want to do as well as the areas where you have questions, need help, or still need to make a decision. As with your site map, your designer may have feedback or ideas that you can incorporate into the plan as you go. You can always come back to this and refine it as you go (see the next step), but the important thing is to start. Once you have a basic plan in place, share it with your designer and schedule some time to go over everything with them and make sure that you’re on the same page. They’ll likely have feedback, questions and advice that you can use to improve the plan and make it better. As you review the plan together, make sure you’re clear on exactly who is going to be creating each piece of content and when everything will be due to the designer so that they can incorporate it into the final website. Depending on the level of changes you and your designer end up discussing, you may want to go back and update your document, or even hit “Save As” and create a new version of your plan. You should now have all of the details you need to actually create the content efficiently and strategically. You can create content page by page, or go through your notes and identify all of the written content, graphic design needs, etc. so that you can batch the work and/or outsource it to someone else. This part of the process is generally done at the same time that the web designer begins developing the actual website – you’ll be working in parallel so that, while you write the actual content for each page, they’re setting up the skeleton of the website and putting meat on the bones. You should be working towards a deadline where you give all of the content to the designer; they’ll then plug it into each page and do any additional design and formatting that is required. And that’s it! If you want even more resources for planning your new website, take a look at my free email course, Plan Your Redesign. There's a truckload of valuable information in there to help you develop a solid plan for your website redesign -- one that that pays massive dividends for your brand and business. You can get started here.